There are plenty of Italian restaurants on our shore serving pastas but there’s hardly one who serves fresh pastas made from scratch. Most restaurants tend to use the regular pasta for many reasons. Fresh pasta is extra work and doesn’t keep as well as the dry ones too. Texture of fresh pasta is also very different and takes extra effort to ensure that the al dente texture is well controlled during cooking. Merrow Pasta, located in USJ 10 in Subang, was born because the owner enjoys fresh pasta. Hoping to introduce fresh pasta to our shores, Merrow Pasta offers a solid list of house made fresh pasta daily paired with various classic sauces. The restaurant has a really lovely décor. The moment one walks in, one feels at ease and in comfort. Lots of wood are set in contrast with black. The whole dining room is set around the open kitchen and so one actually catches live action cooking as well as the aromas that waft through the air. 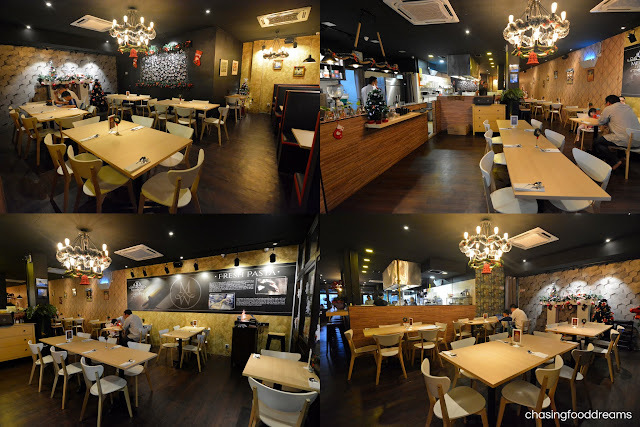 A minor setback here is that the open kitchen does set a smoky ventilation for the restaurant. However, we were assured that the restaurant is now considering to seal up the open kitchen with glass soon to provide a better comfort to diners. Since we were there during Christmas season, the whole restaurant had really lovely festive décor. There is also a wall filled with many photos of the patrons that dine in Merrow Pasta. 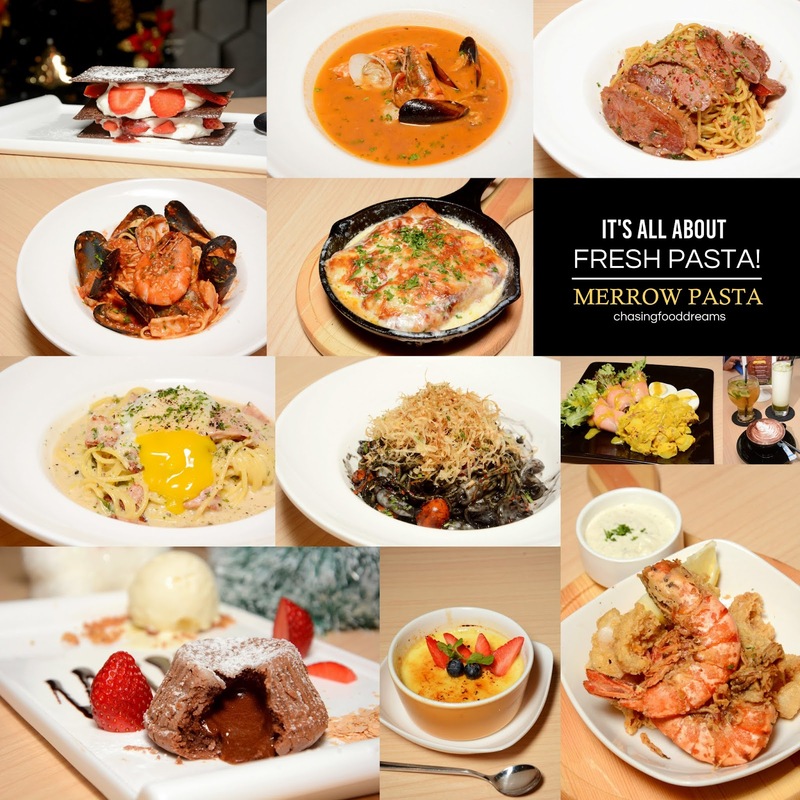 The menu is indeed decent with quite a few pasta classics as well as some appetizers, salad, soup, main course and desserts. We quenched our thirst with Refreshing Green (RM9.90), Cappuccino (RM9.80) and Macha Green Tea Latte (RM10.30). All coffee and tea are from Caffe Richard. To kick off our meal, we decided to try their house signature Smoked Salmon Salad (RM19.60). It wasn’t what I expected but nevertheless, this one is very good. It’s quite a sizeable portion with smoked salmon rolled with crisp greens, warm beef bacon potato salad and egg. The potato salad was delicious, reminding me of German potato salad. It was tangy and quite tart with soft potatoes and beef bacon bits in mustard dill dressing. The tartness of the dressing did overpower the salmon but since I like the potato salad, I didn’t mind this pairing. The Fruitti Di Mare Fritto (RM17.80) had crispy and lightly battered squids and prawns served with Tartar sauce. The appetizer was also decent and well cooked. We enjoyed this despite having to peel the large prawns with the sauce. I always love soup so when I saw that Merrow Pasta had soup, I wanted to try the Fresh Seafood Soup (RM19.80). At sight, the soup looked wonderful with its gorgeous hue of orange and medley of seafood. At taste, the soup was even better. Rich with a moreish and tangy seafood essence, the tomato based seafood soup was delicious. There were also generous seafood of clams, mussels, squid, crab and prawns in the soup. Pasta time and we were told that the Carbonara (RM19.60) is one of their best seller. The pasta looked enticing at sight with the poached egg. Well sauced, the spaghetti had generous turkey ham slices and was finished with herbs and black pepper. It is very rich with the heavy cream and poached egg with molten egg yolk. Overall this was decent but not my favorite. The pasta was good as it had the al dente texture that I enjoy. The Marinara (RM20.80) tasted quite similar to the seafood soup earlier except this was thicker. Lots of mussels, squid, clam and prawn again in this pasta, making it really value-for-money. The pasta was cooked well again here but I personally felt the sauce was a tad weak here. It’s not bad but I prefer a heavier tomato flavour so it’s more of a personal preference since my other friends enjoy this dish. What I enjoy a lot was the Con Salsa Al Nero (RM27.60). The squid ink sauce had delicious garlicky and wine flavours with a surprising hit of chili heat. The bonito flakes also gave the pasta a rich umami flavour. The plump and tender squid was also yummy with the al dente pasta. The Smoked Duck in Teriyaki Dry Chili Sauce (RM19.60) was also scrumptious in my books. The spiced up teriyaki sauce had a nice balance of sweet and savory with a bit of heat. The smoke duck added a nice flavours and texture to the pasta. As it was the festive season month, we decided to enjoy desserts. Chocolate Pasta (RM19.60) had us curious and so we went with an order of this. Basically inspired by mille feuille, this one had a chocolate pasta baked till crispy and layered with whipped cream, strawberries and berry coulis. Pretty unique way of eating pasta! The Orange Creme Brulee (RM13.80) was not too bad. It had a really lovely cream that was nicely set but it lacked the crusty crunch of the caramelized top. Nevertheless the crème brulee had a nice subtle citrusy note that was refreshing and sweet.